TipsNotesVideo: Cauliflower TotsCooking for a Crowd? Preheat oven to 400 degrees. Spray a baking sheet or line with parchment paper or foil. Grate cauliflower on large holes of a grater. 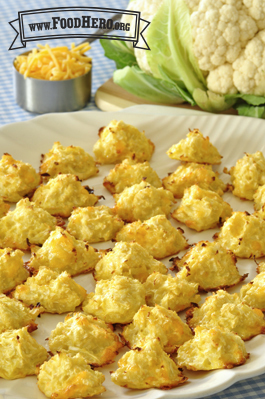 In a medium bowl, combine cauliflower, egg, flour, cheese, and salt; mix well. Press mixture together to make about 15 small balls or logs; Place on the baking sheet with space between each ball or log. Bake for 20 minutes or until cooked through. For extra crispy tots, broil for an extra 2 minutes. Watch closely to avoid burning. 1 Comments for "Baked Cauliflower Tots"
We really, really loved this recipe!! It was super fast, my 4 year old combined all the ingredients on her own and formed the tots, the cauliflower took less than a minute to grate and they also cooked fast. Plus they tasted great to all! Even better right out of the oven. Only change, next time i will double the recipe.